Now Archived! PolarConnect event with Svea Anderson and Dr. Donie Bret-Harte from Toolik Field Station on 13 August 2018. You can access this and other events on the PolarConnect Archives site. 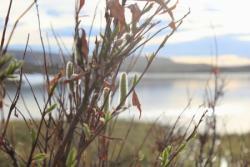 Willows along the bank of Toolik Lake. Toolik Field Station, Alaska. Photo by Regina Brinker. Ecosystems develop and change through interactions between living things and their physical environment. A shift in vegetation is one of the most important changes an ecosystem can experience, because it can alter exchanges of energy (originating from sunlight), water, and elements such as carbon (C) and nitrogen (N) between air, plants, and soil. In the Arctic, a widespread shift from tundra to deciduous shrub-dominated vegetation appears to be occurring. 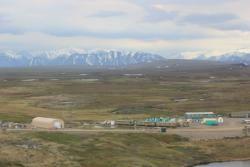 An aerial view of Toollk Field Camp with the Brooks Range in the background. Toolik Field Station, Alaska. Photo by Regina Brinker. The research team was based out of Toolik Field Station, an 8-10 hour drive north from Fairbanks, Alaska. Toolik Field Station is operated by the Institute of Arctic Biology at the University of Alaska Fairbanks and has hosted hundreds of researchers and students every year since 1975. The team will drive to an additional field site ninety miles north of Toolik Field Station. Teacher Svea Anderson and researcher Dr. Donie Bret-Harte discuss research from Toolik Field Station on Shrubs, Snow and Nitrogen in the Arctic. This event was broadcast live on August 13, 2018. Local news station, KVOA-TV, interviewed Svea Anderson on May 9, 2018 about her upcoming PolarTREC expedition. On May 30, 2018, the Arizona Daily Star published an article on PolarTREC teacher Svea Anderson. Project Funded Title: Collaborative Research: Shrub Impacts on Nitrogen Inputs and Turnover in the Arctic, and the Potential Feedbacks to Vegetation and Climate Change. what causes the difference in depth to permafrost? Svea,what causes the difference in depth to permafrost? The temperature hasn't reached into the negatives, thankfully! The coldest it has been has been low 30's. The wind adds to the chill.